When Charles Darwin, Leonardo DaVinci, and other famous scientists were engaged in the journeys and studies that literally changed the world, most individuals used a simple tool when studying the natural world, the field journal. Field journals have always served as personal tools for scientists, writers, and artists, focusing research, training the eye to make careful and accurate observations, and creatively augmenting learning about the intimate details of a particular ecosystem, animal, or plant. A field journal entry combines words and sketches in a way that records both what you see and your curiosity about your subject. You can turn any sketch into a field journal entry by including some basic information (time, date, location, weather, etc. ), and by making some detailed observations to accompany your sketch. Field Journals enhance personal interaction with the world around us. Also known as "location sketching", the practice of field journaling encourages taking opportunities to slow down and concentrate. The opportunity to record thoughts and observations through words and drawings compels closer examination of a subject. Recording what is seen through the medium of a field journal helps to cement that image in memory. As a record of observations and experiences develops, a personal field journal has the potential to become a personal field guide which can be referenced throughout one’s life. The Field Journal can take many Forms. The physical nature is secondary - a great field journal might be a beautiful leather-bound volume or a stack of loose scraps of paper. Often, it becomes a meld of personal life observations and natural history anecdotes. A sketch of a magpie may be accompanied by the day’s ‘to-do list,’ or a phone number may be scribbled on the back of a note about mule deer seasonal migration. Some advocate keeping non-nature life notes in a separate journal, but I encourage the keeping of a thorough record of life as it is lived. Include the grocery list if it is present in your awareness while you are out birding on an early spring morning. Fundamentally, both are part of your life experience. More pragmatically, you will feel freed to concentrate on warblers if you are not attempting to maintain that list in your conscious memory. to field journaling, the point is to be curious, to strive to respond to your own curiosity with thoughtful explanations for what you observe, and to always deepen your relationship with the world around you. For me, the connection was made when I realized that my interests in art and science could be combined in the field journal. My high school biology teacher once encouraged me to look into scientific illustration, but it took many years of trying other things before I realized what he was talking about. My appreciation of nature's intricacy could be expressed by combining words, illustrations, and curiosity. Personally, my field journaling practice has directly resulted in a deeper relationship with the ecosystems in which I live. Professionally, it has also yielded countless opportunities to share information, encourage others to ask questions, and even help others to develop their own skills as naturalists, engaged citizens, and even as artists. Humility – the best learning occurs when we recognize there is always more to learn. I strongly recommend resisting the temptation to bring both camera and field journal unless you have the willpower necessary to resist just snapping pictures rather than taking field notes. 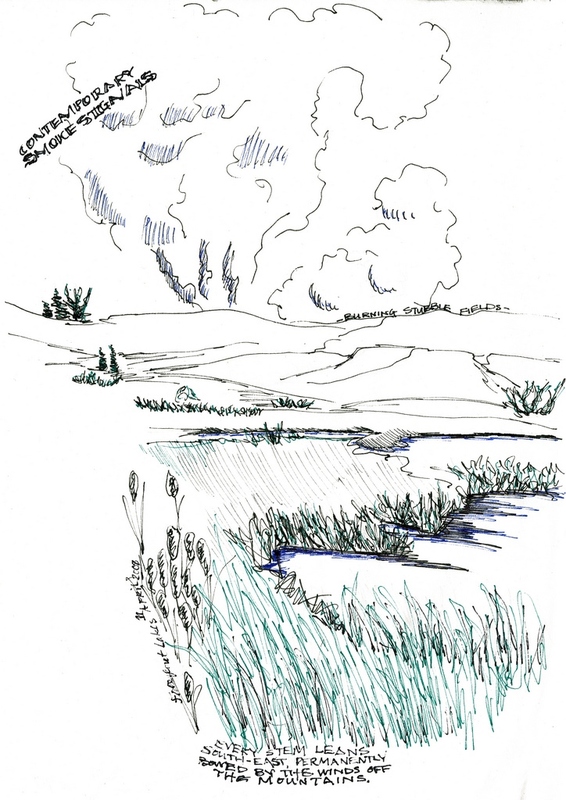 Loved your blog post on field journaling...When I think of field journaling, the Lewis & Clark Journals are the ultimate example, chock full of obersvations & drawings! I was just browsing your picture gallery, and especially the pages of your nature journal. I love it! Very impressive, you're really good at it! I was impressed by the chicken, and how you captured it with very few lines... But the other ones are great too (the squirrel!)! I wish I had more time to try it too, even though I'm not sure I'd be any good at it (I'm really looking forward to be retired).